Our 29th season of FREE Shakespeare in the Park opens this week! 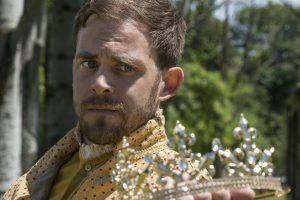 We’re excited to be bringing you full-cast versions of Richard II and The Comedy of Errors, and Backyard Bard productions of Hamlet and A Midsummer Night’s Dream. In all this summer we’ll be giving 62 performances in 21 area parks big and small. We’ll be at Seward Park, Volunteer Park, and High Point Commons in our opening week. Check our calendar page for a listing of all shows, or click the play links above for info and schedules for each individual play. Our first week always includes the unofficial kickoff to the summer theater season: The 17th annual Seattle Outdoor Theater Festival will be at Volunteer Park Saturday and Sunday, July 15 & 16. The festival features nine local theater companies and 16 performances on three stages over two days, all free, free, free! Pack a picnic, bring a blanket, and enjoy some great theater in the outdoors in our marvelous July weather. Above, that’s Gavin Douglass, who is playing the title role in Richard II this summer, contemplating the crown.